From large custom designed hand made ceramic tile panels & murals that create a stunning focal point to any room , small friezes and border tiles that give jewel-like accents of bright colours – individual tiles all hand painted in the superbly rich, glossy aquatic colours produced by our unique Ancient Persian glaze system. If you are thinking of really making a splash , create your own oasis & try a route that is a bit out of the ordinary ! 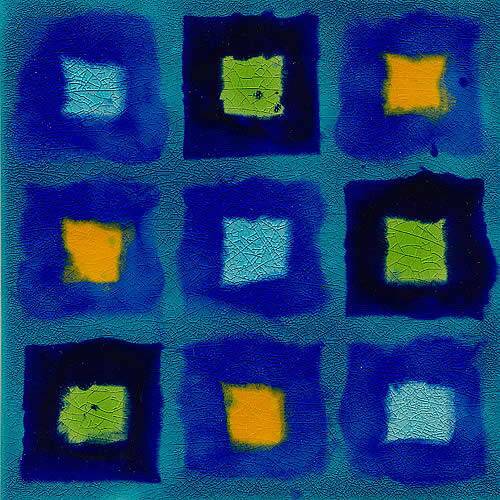 Some ideas on how to use our hand -decorated tiles … scroll down for our whole range & more info ! Visit one of our lovely stockists , they will have some Jaafar Designs tiles on display & have a chat with them as they will have lots of ideas on how best to use them for your own decor scheme. Pick up the phone & call us ! 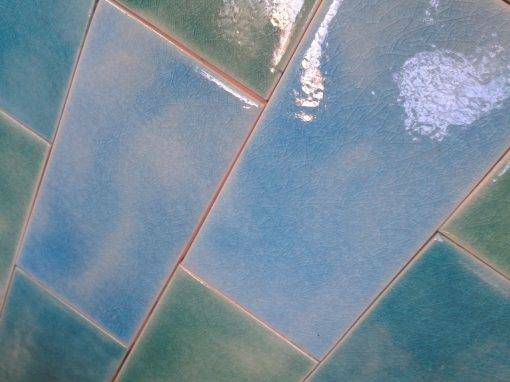 We’d love to help out & have a good chat with you so your tiles look as good as possible ! 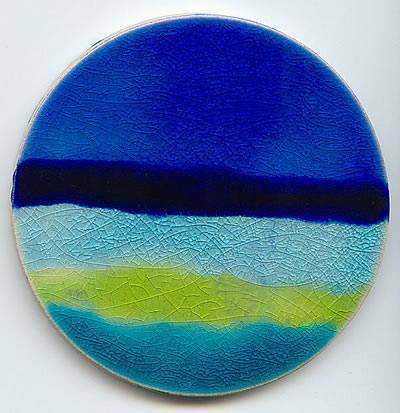 The beautiful colours of my Persian glazes inspired Corinne Twining, a stockist of ours before she moved to Cyprus, to design her own range, now marketed internationally through www.persianglazes.com. 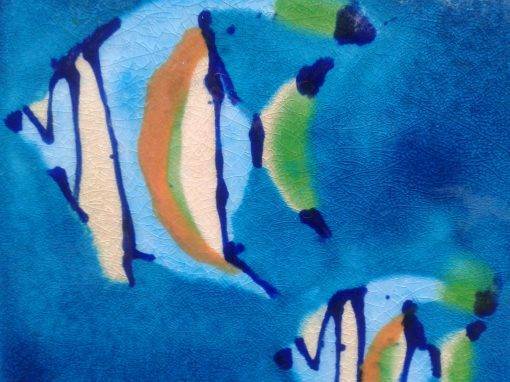 Corinne has combined my colours in simple patterns which can be combined to produce amazing and unique designs. I am rather tickled to have set off this flow of inspiration! 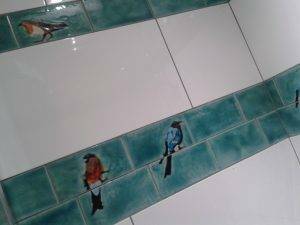 Beautiful hand painted bird tiles in a shower on 10x20cm tiles used with a white 30x60cm tile. 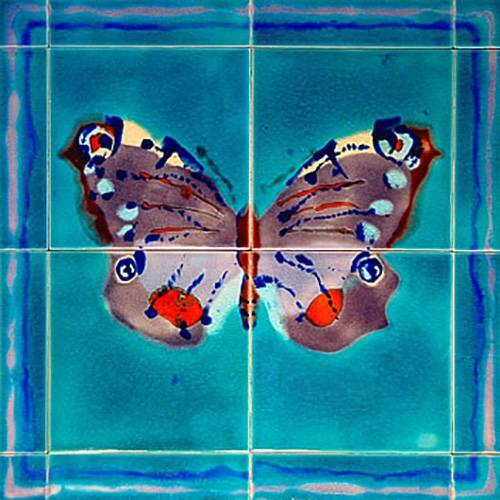 Our hand painted tiles are designed to complement & work with a wide range of other manufacturers tiles e.g. white tiles that can be bought from many other tile suppliers . For example , Alice & Tom used our 10x20cm picture tiles with a large format 30x60cm white tile in their bathroom & they look stunning ! Prefer smaller field tiles ? How about our absolute classics of a 10x20cm decorative picture tiles with our matching plain brick 10x20cm tile or our best selling 15×7.5 cm picture tiles which look just amazing with their matching 15×7.5cm metro tile ? Also ,try our 20x20cm decor tiles as a wide border round your bath or shower cubicle with other 20x20cm or 20x30cm white tiles . Our 5x20cm Picture border tiles look fantastic used as an accent of gorgeous colour between white tiles , the Stokes family in Kent used them with a 20x25cm white tile bought from their local tile shop . 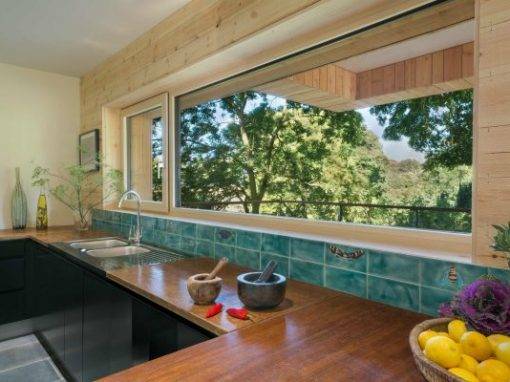 The kitchen is probably the first place you think about adding decorative tiles – it is an excellent place to add real visual interest . A kitchen backsplash is the best way to introduce dramatic focal point in a kitchen & changing your backsplash can make a huge difference , perhaps try a tile mural behind a cooker or sink backsplash ………the Butterfly panels in particular work really well with a smaller 10x10cm or 10x20cm cream tile. Try them with a darker grout which will create a nice modern essence. We were looking for something really unusual and different. As soon as we saw your tiles, we just had to have them!